I am revisiting “With Reservation”, first published last year, in recognition of Native American Heritage Month and the continuing battle in my state (Line 5) and others to recognize treaty rights and improve the living conditions of and opportunities available to Indigenous groups. We have a long way to go. The United States celebrates something we call “Thanksgiving” this week. In schools, students are taught the story of Native Americans who helped Pilgrims during a difficult season and the meal they shared to celebrate the harvest. In truth, colonialism resulted in the decimation of hundreds of nations and millions of human lives. Those who didn’t perish faced the loss of culture, dignity and ancestral lands. The destruction to natural resources that Europeans wrought on the so-called “New World” has included everything from buffalo to water. The persecutions and resource grabs continue to this day. The complete original post can be read here. January 14, 2017 .Reading time less than 1 minute. Pro-pipeline state lawmakers are proposing a rash of bills that will criminalize protests and put protesters lives in danger. 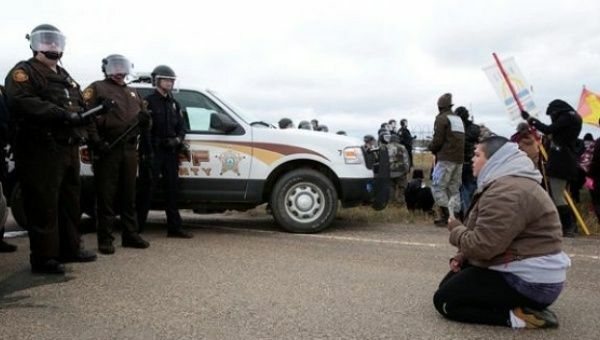 Water protectors in North Dakota may need to be more careful when crossing the street if a proposed bill to exempt drivers who “unintentionally” hit or kill pedestrians who are blocking traffic is passed. Republican state lawmaker Keith Kempenich introduced legislation to make an exemption for drivers who unintentionally injure or kill pedestrians who are obstructing traffic on public roads. “It’s shifting the burden of proof from the motor vehicle driver to the pedestrian,” Rep. Keith Kempenich, R-Bowman, told the Bismark Tribune. Kempenich’s 72-year-old mother-in-law was blocked by a group of protests on a roadway and he admits the law specifically targets protesters. by tanks, drones, tear gas and rifles. Can you hear the children crying? felony charging is TOO HARD. Posted in human rights, noDAPL & poetry. Bookmark the permalink. Note: While this is my opinion, I would remind all my readers that the persecutions one man receives for peacefully praying on a public access road or in a public area of any kind are easily forced upon others. Once we start burning books, history proves that there is no determining on which page we will stop.